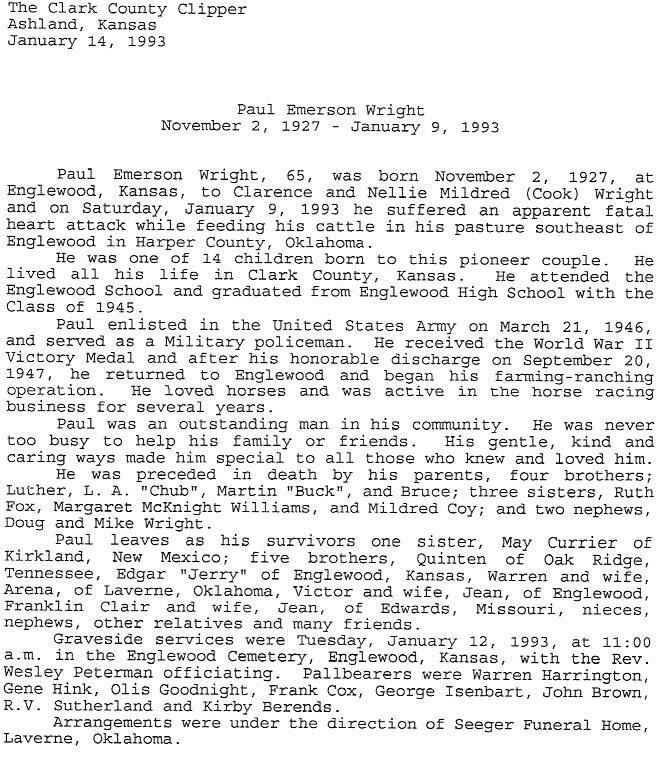 Paul Emerson Wright, 65, was born November 2, 1927, at Englewood, Kansas, to Clarence and Nellie Mildred (Cook) Wright and on Saturday, January 9, 1993 he suffered an apparent fatal heart attack while feeding his cattle in his pasture southeast of Englewood in Harper County, Oklahoma. He was one of 14 children born to this pioneer couple. He lived all his life in Clark County, Kansas. He attended the Englewood School and graduated from Englewood High School with the Class of 1945. Paul enlisted in the United States Army on March 21, 1946, and served as a Military Policeman. He received the World War II Victory Medal and after his honorable discharge on September 20, 1947, he returned to Englewood and began his farming-ranching operation. He loved horses and was active in the horse racing business for several years. Paul was an outstanding man in his community. He was never too busy to help his family or friends. His gentle, kind and caring ways made him special to all those who knew and loved him. He was preceded in death by his parents, four brothers; Luther, L. A. "Chub", Martin "Buck", and Bruce; three sisters, Ruth Fox, Margaret McKnight Williams, and Mildred Coy; and two nephews, Doug and Mike Wright. Paul leaves as his survivors one sister, May Currier; five brothers, Quinten, Edgar "Jerry", Warren and wife Arena, Victor and wife Jean, nieces, nephews, other relatives and many friends. Graveside services were Tuesday, January 12, 1993 at 11:00 a.m. In the Englewood Cemetery, Englewood, Kansas, with the Rev. Wesley Peterman officiating. Contributed by Al & Pearl Ellis June 11, 2006.